As much as I’ve loved my time in Newfoundland, It’s also time to leave. I’m typing this from the Marine Atlantic ferry terminal in Port aux Basques, waiting for the 1:00am ferry, after downing a Faxe, my canned beer of choice for this tour (once again, keep this in mind if you choose to read further). $3.99 for a 10% beer seems like a bargain to me, but I’m still on vacation and my budget is not as strict. I’d rather take a later ferry and arrive in North Sidney during the daylight, then take an earlier one and arrive in the middle of the night. I really don’t want to leave here, there is so much to explore, but if I don’t, the next adventure can’t begin. Ah, the next adventure, this trip has definitely changed me and this change I needed to make. After leaving Norris Point I had an empty feeling inside, I felt lost in the world. 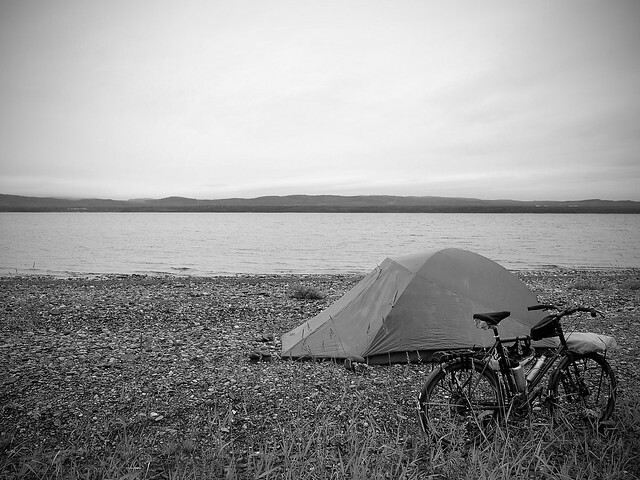 I pedaled south to Deer Lake, a beautiful spot that I camped at on the way up, and that evening, after a Faxe, I found myself again. I had originally planned to go to Ghana, Africa for the winter, but I realize I still haven’t seen my whole country. I haven’t been to Alaska and Hawaii, but these are states I want to live in for a bit and not just travel through, so they take a different plan. Where I really want to go is the Deep South, the land of strange accents and even stranger food. I’ve traveled through the northern and central part of the US by vehicle, met the great people and have seen the great sights, but the south….. it’s intrigued me and scarred me at the same time. I’ve spent some time in Kentucky’s Red River Gorge rock climbing and I must say, it’s definitely different than Vermont. The plan is to leave in September, travel south, far south, then west to desert of Moab Utah. Doing this I avoid the heat and bugs of the southern states and arrive in Moab for the winter, something I have wanted to see for years. From there, who knows, that’s a ways away. My plan is to head south to Tierra del Fuego and hopefully the Falklands Islands, but I’m wandering, not touring, so my plans are subject to change. Anyway, before I do any of that, I must finish this trip, the focus of which has been riding the T’Railway. Since arriving in Newfoundland my pace has been quite relaxed and it is rare that I am up and riding before 9:30am, this day was no exception. I was a little ways outside Stephenville Crossing and at this point the trail runs quite a bit further inland than the TCH. No traffic noise and beautiful scenery. This was also the day for meeting locals. I’ve meet quite a few great people up until now, but on this stretch it seemed every ATV going past, although there weren’t many, would stop, shut the engine off, and ask “so…. where you from”? This would, of course, lead to a twenty minute conversation that included some life history, local knowledge, directions to a great camping spot and an offer of….. something. These are the moments I will miss most from Newfoundland. looking for a better spot and met a couple who’s minivan had broken down (cars use this section of the trail as well). In typical Newfoundland style, a broken vehicle is not a problem, but a great excuse for a campout, complete with a barbecue. I was, of course, given a plate of food, a cold beer, and an invitation to camp. This was a low mileage day, but this is not a race. The next morning, after filling up my water bottles from an ice cold spring just down from camp, I headed for Corner Brook, the biggest “city” on the west coast of Newfoundland. After exploring the downtown, restocking my food supply and some quality internet time, I burned through quite a bit of the day. 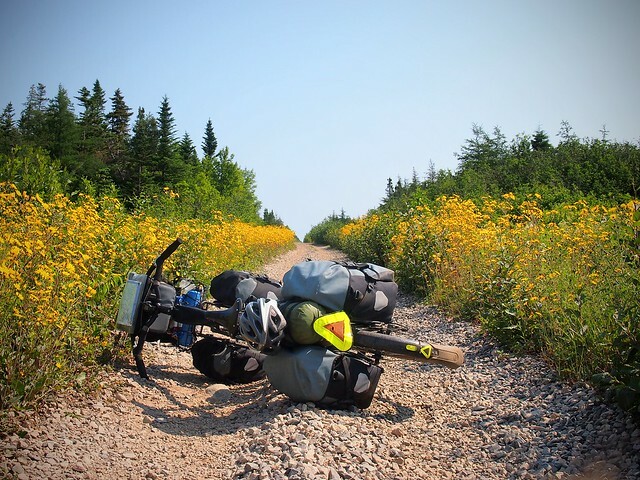 The T’Railway is a bit difficult to follow out of Corner Brook, so I jumped on the TCH and blasted downhill to Steady Brook with the hope of finding dome ATV trails and avoiding the long highway ride. I wasn’t disappointed and was given directions linking back roads and trails back to the old rail bed. 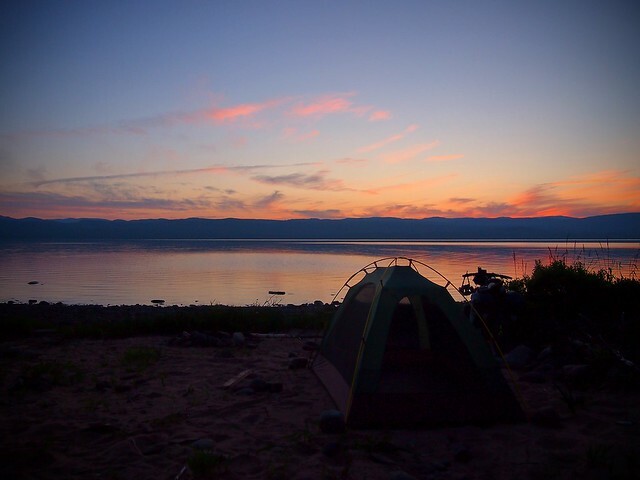 The sun was going down as I rode along the east coast of Deer Lake, but I wanted a camping spot with great swimming and a beach, I found what I was looking for. From the Town of Deer Lake the T’Railway heads east, through the Gaff Topsails and eventually to Saint John’s, but my plan was to head north, to Gros Morne National Park. 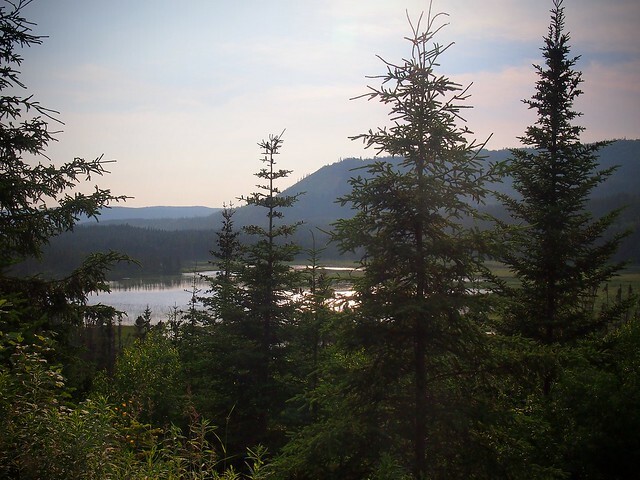 Previous PostFollowing the T’Railway along the west coast of Newfoundland – Part 2Next PostNorris Point and Gros Morne National Park – The most relaxing places I have ever been.